I actually had to scan some of these photographs. That's how long this process has been going on. Also a somewhat shocking if not sudden reminder of how old I am getting. But that's another story. So it's 2005. I'm in a boat. On a lake. Well,.. fishing. I know, what a shocker. 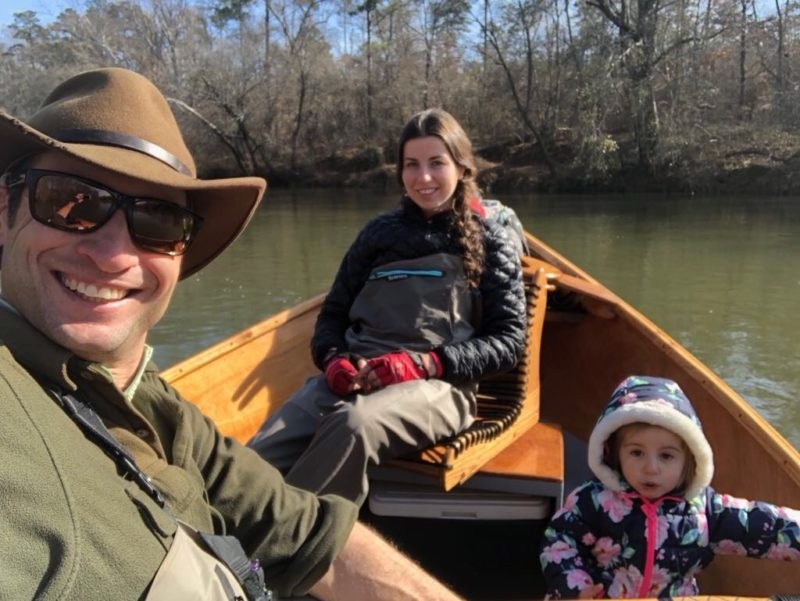 Then a five year old calls me on my cell phone, which I remember too late that I forgot to turn off when I got in the boat, thus breaking my usual rule. It's my five year old nephew. He wants to talk about boats. I then run the trolling motor so my friend Steven Wright who is in the bow can keep throwing poppers at the banks, and we wander around the lake for a half hour or so while Collins asks me questions about boat designs. Huh? He wants to know what each type of design is for, what kinds of materials the different designs are made from, and how they are put together. I'm amused and of course patient but not at all sure where the conversation is going (I mean, he is five) until the kicker: "Uncle, can we build a boat?" Uhhh... sure. I mean, how else could you answer that question? The early stages of the thing were just plain exciting. Since I was short on tools and know-how I went long on time to make up for it, and at each step checked my measurements compulsively. 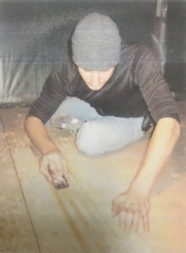 Cuts that might normally have been made by specialized electric saws got made with a hand planer, and surfaces that might normally have been shaped by a hand planer got shaped by sandpaper. It was slow, and it was winter and colder than the ace of spades, but I was having fun. Collins was too, especially when he got a hold of the air compressor hose and got to run around blasting piles of sawdust into miniature nuclear blasts all over the shop, which he did a lot. Eventually though I had the hull panels scarfed together and the bid radius cuts done and then Philip Vogh, my best friend since sixth grade, drove up from middle Georgia to help me stitch the thing together. We followed Jason's plans to the letter still at that point, and the holes got drilled and the wire got twisted and the spot fillets got epoxied and pretty soon we were looking at a very different space within the shop. Less space that is, because it suddenly seemed to have a boat in it! 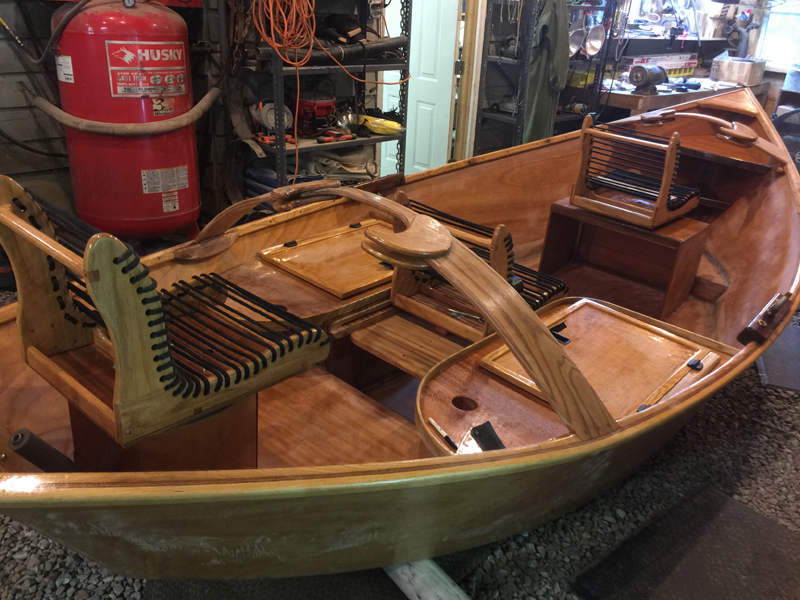 That was an awesome weekend and I'll remember it forever, watching all those oddly shaped and very long pieces of mahogany slowly but surely take the shape of an actual hull. Fun stuff. After that is was more filleting, more planing, more fiber-glassing, and lots and lots more sanding, but the hull just got better and better of course as I went along. By this time Collins had more or less loss interest, as five year olds tend to with things that take more than a half an hour, but I was becoming obsessed. 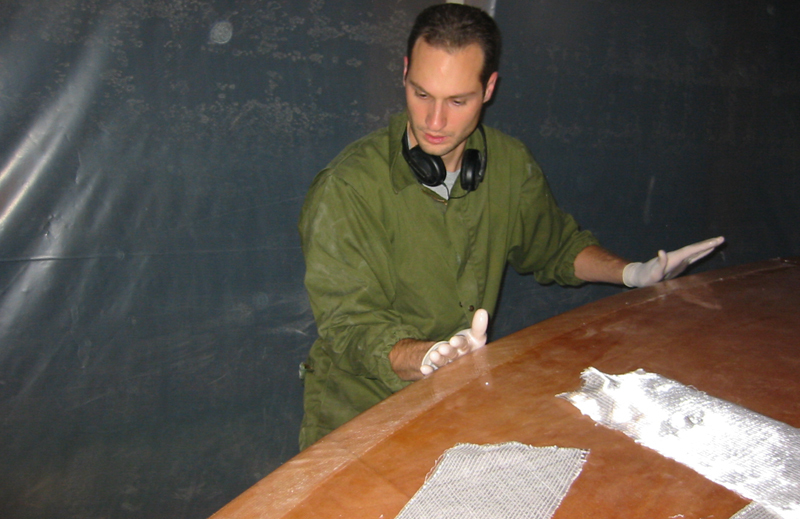 (Yes, that is actually a bit and brace in my hands in the photo above) So I got to work on the fiberglass right away. I wanted to put this thing in the river, and pronto. That was not to be. 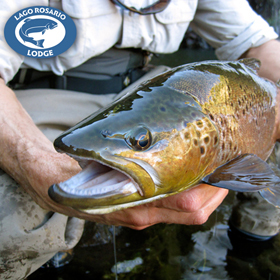 As the good Mr. Haig-Brown once said, "everything moves and changes, and no two days are ever the same for a fly fisherman." Nor are any two years. Nor two decades, continents, hemispheres. I could go on and on. And I guess I did. There were moves from here to there, long walks, long flights, long stories. 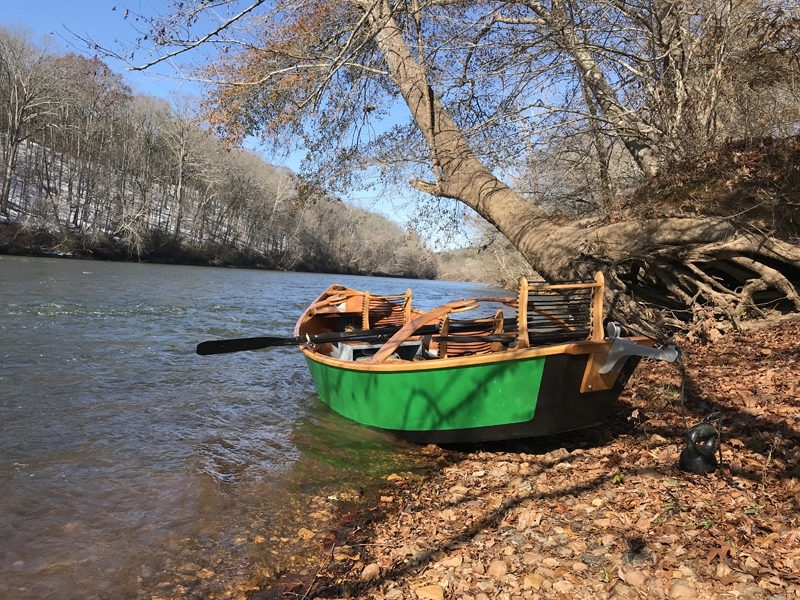 The unfinished project got moved from state to state as I left the country and came back over and over, then eventually I pretty much stopped coming back; and for years I thought about the thing sitting there in a barn back in the Appalachian mountains as I guided clients out of other boats on waters all over the world. Oh well. Someday I thought. Someday we'll finish it. In the end I credit my daughter Aya as much as anyone with the fact that the boat is now completed. When she was born at the beginning of 2016 there was finally a tangible reason for me to be in the United States for more than the usual couple of weeks just passing through. Granted, even since the child has been born two years ago I/she/we have been in quite a few countries and have driven across most of the North American landmass. 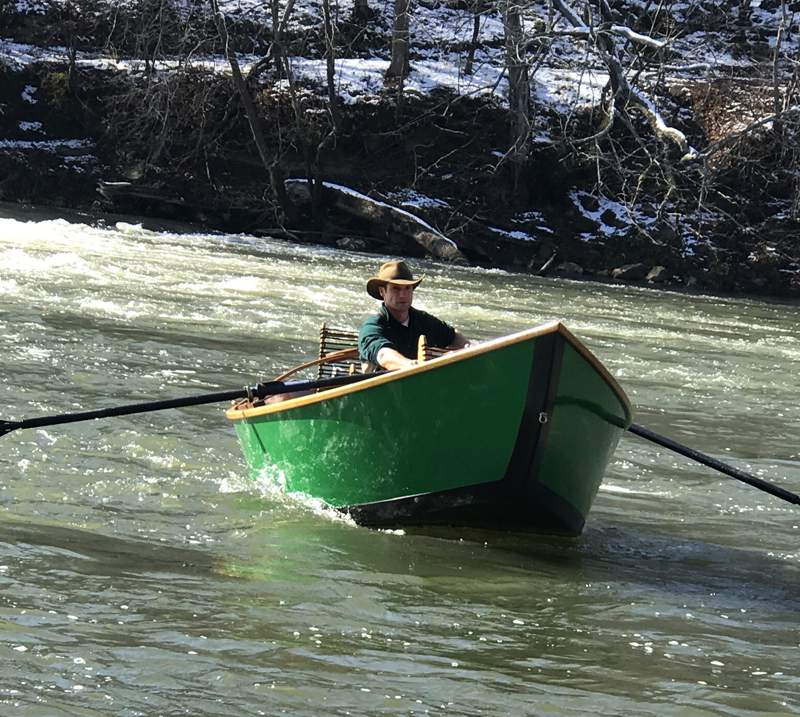 But her presence and her grandparent's magnetism must have provided just enough pull to stabilize the whole thing's process, because the boat has now floated down several rivers and is being stored in its same Appalachian barn till our return, except this time not as a project but instead as an actual boat. 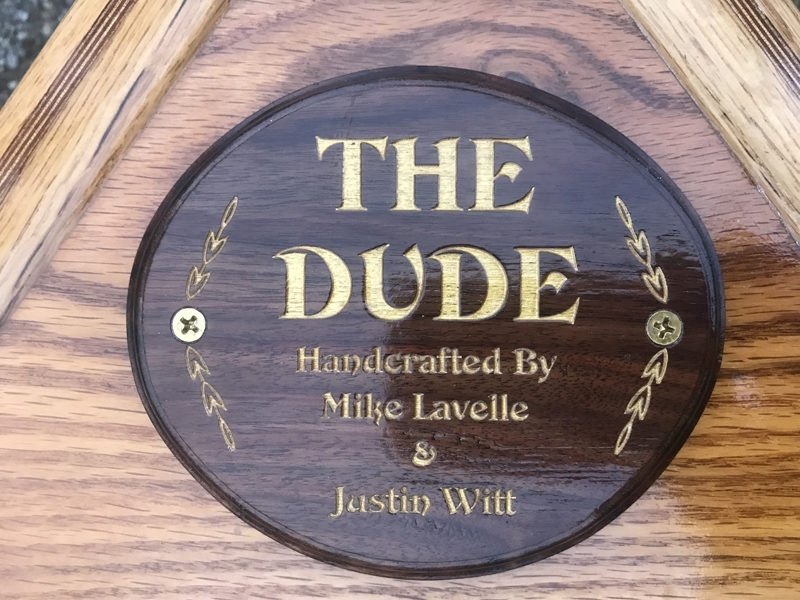 Aya can't by any means take all the credit though - and here I'll introduce the boat's namesake - The Dude. The Dude is of course Michael Jay LaVelle, or " Grandpa", as Aya calls him. 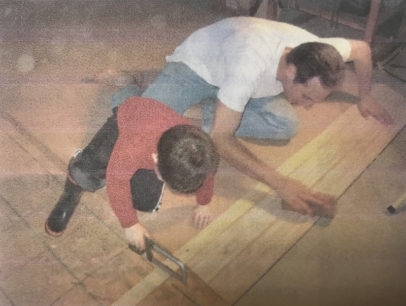 See Grandpa was a mold maker most of his life, and if you don't know what that means then it will suffice here to say that mold makers think in thousandths of an inch, not eights or sixteenths or even thirty-seconds. It's a whole nother ballgame. 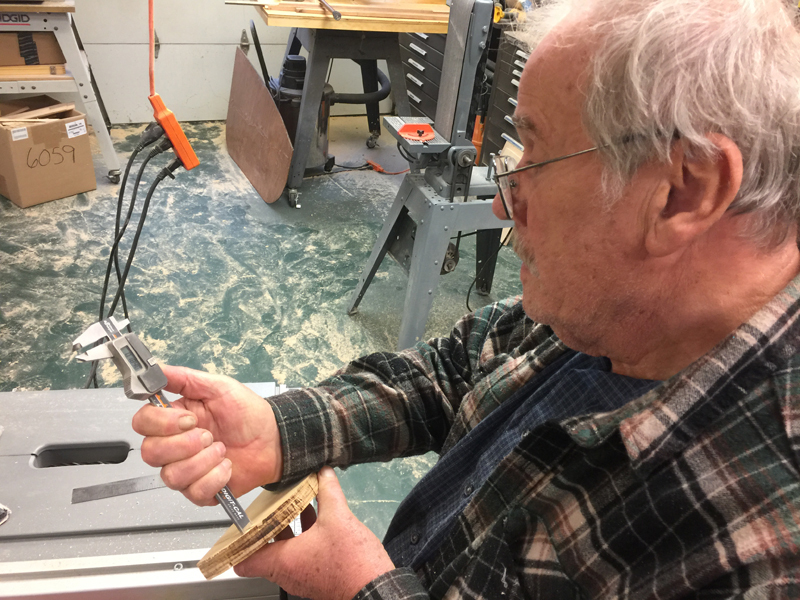 But Mike still had his shop there on Garrison Lake when he retired, and a keen interest in switching from steel and aluminum to wood as his medium of expression. That switch got made a few years ago, and the furniture and artwork that started to make its way out the door of the shop was flat out astounding. He was hesitant at first to take on the boat, but I convinced him. 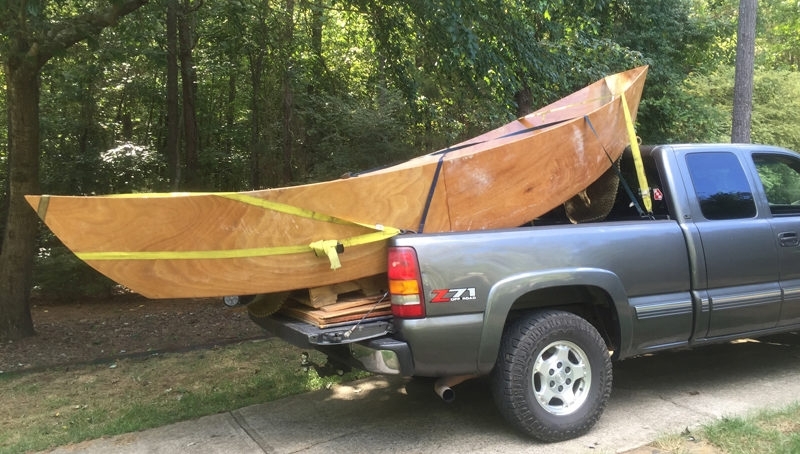 So we went up to the mountains and got the thing out of the barn, blew the dust off all its parts and packed up all the tools I had used in its construction up to that point, strapped it all into the bed of the Chevy, and drove home to the family place on Garrison Lake. I then tried to apply my usual modus operandi to the continuation if its construction, and simultaneously proceeded to begin to drive Mike absolutely nuts. We just don't do things in anything like the same way. And largely this is because most of the time I have no f-ing idea what the hell I am doing, and he does. We laughed a lot though. 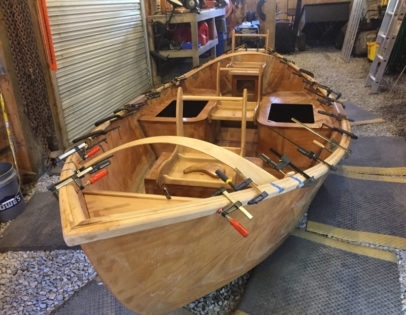 And in between my long road trips and shorter fly-outs the dry boxes got finished and things like gunnels and knee braces and level decks started to actually get shaped and clamped and screwed and epoxied onto the hull. 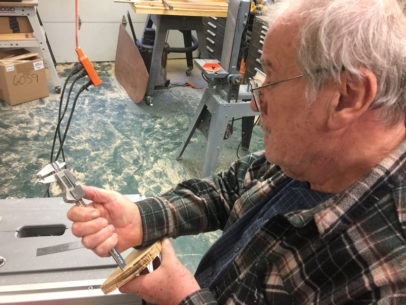 I'd mess around by myself down in the shop with some piece of wood and a square of sandpaper for hours on end and then leave it on the bench to go take Aya for a walk, after which I'd come back the next day and find the thing finished and already in place on the boat, Grandpa busily working on the next piece. Where we collaborated well was in tasks that involved clamps and steam bending - otherwise I mostly had to stay out of his way and just watch and learn, asking questions as he literally milled pieces of oak on his Bridgeport or employed the myriad of other amazingly effective and efficient tools he had at his disposal and also amazingly knew how to use to their fullest potential. But there was just no way to help a lot of the time. I mean, how the hell can you help when the guy is measuring pieces of walnut with a set of calipers? Throughout the process we contacted the boat's designer Jason Cajune at a number of points with questions which he was always happy to give us the time to answer, and even more than a dozen years after I had purchased the plans from him for the measly sum of $125 I have to say he took the entire project just as seriously as we did, which is a testament to his character for sure. Then one day I left and drove the girls all the way to Alaska and back, with Mexico somewhere added into the route, and when I got home the thing was almost done! 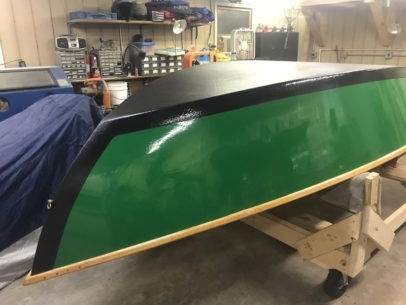 Sitting in the shop with a few minor touches to be applied, but otherwise ready to be flipped over, painted, and bed-liner-ed, then put into the river. So we got to work again. 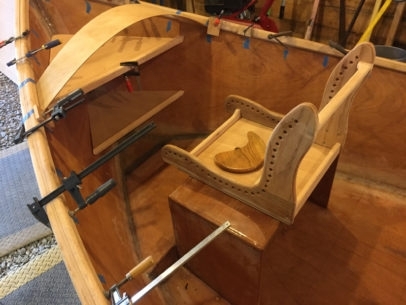 Flipping a 400 pound object upside down is always a bit of an undertaking, but flipping a 400 pound boat that it's taken over a decade to build brings that undertaking to a whole new level of sphincter pucker. 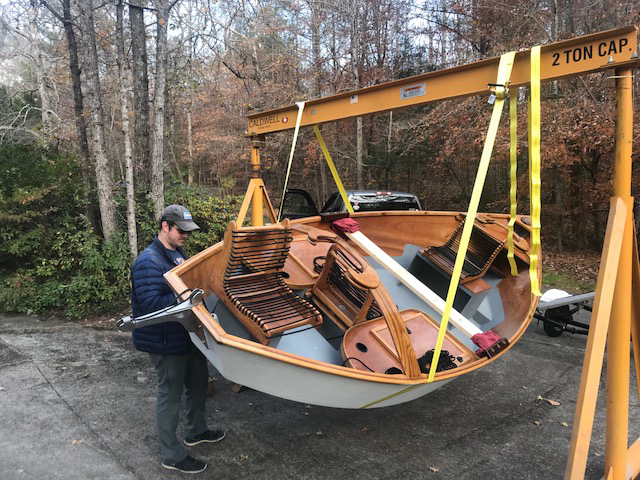 Luckily John Wright came over to help, and Mike still had one of his big hoists in the shop which used to move molds into and out of it that weigh much more than our boat. Of course it wasn't the weight really that was the problem, it was the dimensions and the shape, plus the fact that by its design it was not meant to have all of that weight placed on one side or the other at any time. 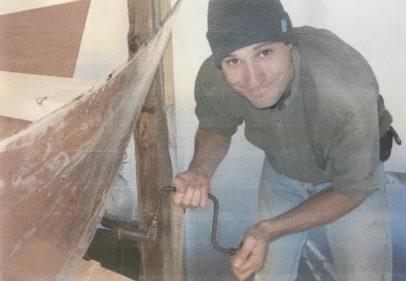 In the end though we got it done, the sphincters un-puckered themselves, and "The Dude" as the vessel had by then been named was strapped down and ready to have seven coats of marine paint applied to it and then be driven to the bed-liner place for the final touch. All of that came out just like we wanted, the reverse flip was accomplished with the help of strangers who just happened to have come buy to look at the camper, and before I knew it the boat was on its actual trailer with oars in the back of the truck and we were on our way to the other side of the lake to.... seriously? This thing is actually going to get put into water??? That was in December, and as it turned out he (The Dude) floated just fine. 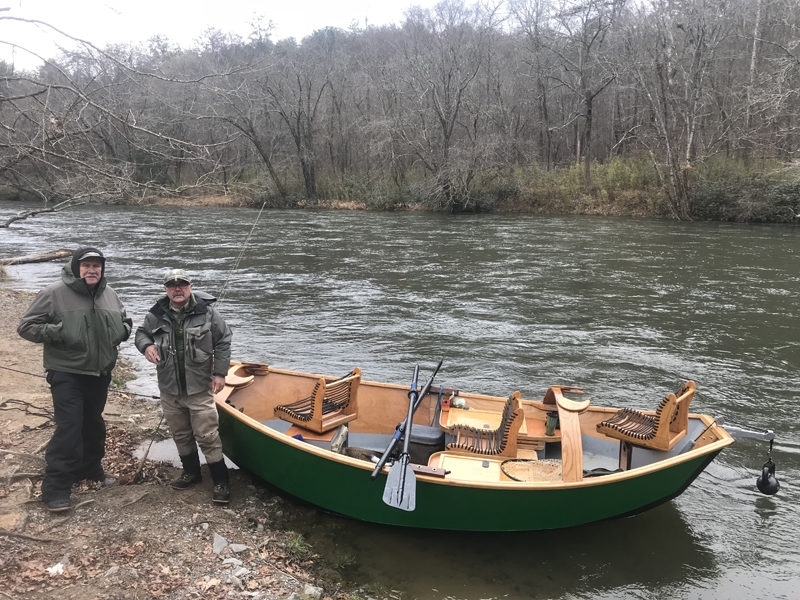 We've run him down a variety of rivers since then, first with a set of plastic oars I borrowed from my good friend Dave Teffeteller and then later with the awesome Sawyer square tops I ordered through Jason. We've of course made little adjustments to our work here and there where it was needed, but the boat is not only everything I had always hoped it would be, it is more. It is the result of a wonderful string of collaborative efforts stretching across thirteen years worth of relationships, spaces, circumstances, and intentions, and it floats and runs rivers just like it should and will for years (and probably generations) to come. Great looking! 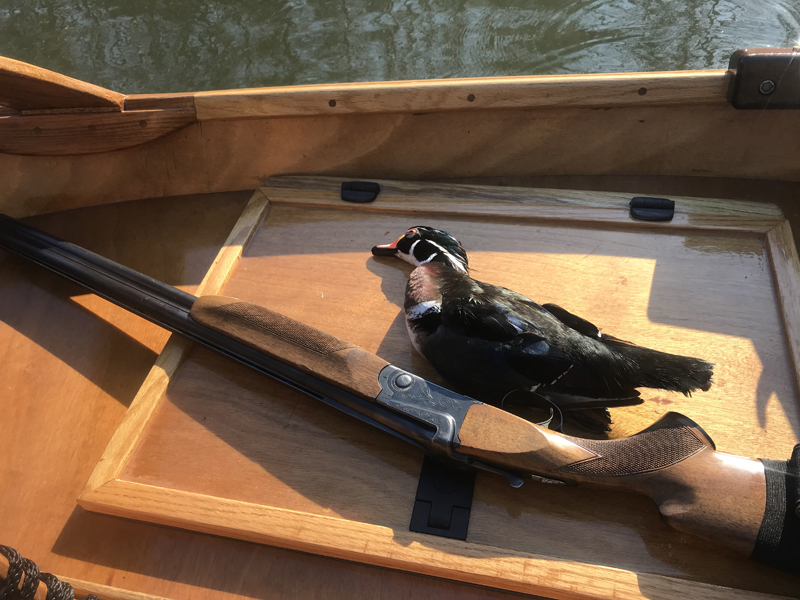 Nice wood duck too! 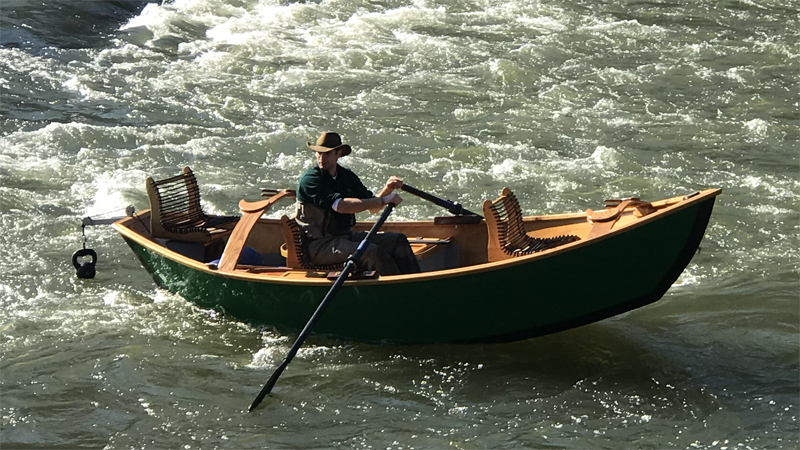 Your float boat is very nice, full of character and pride! 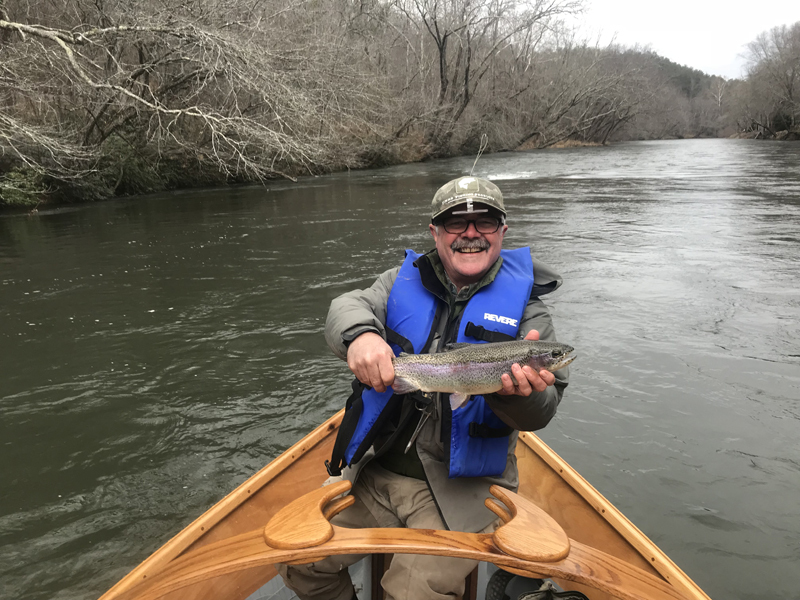 What river were you floating for the woodie and the rainbow? What a journey you and your boat, friends and family have taken! Great story. Put it (the boat AND the writing) in the will. "The Dude" is gorgeous!! So is your precious family in it :) It is amazing how our children inspire us to be our best whether finishing a project or working on ourselves. Mike looks as happy as you do!! Really cool what a "family project" it turned out to be. The best to you and your family!! V.